With my ankle recovering, and no racing for me, I did the next best thing last weekend - went to the races to watch and support Mike! 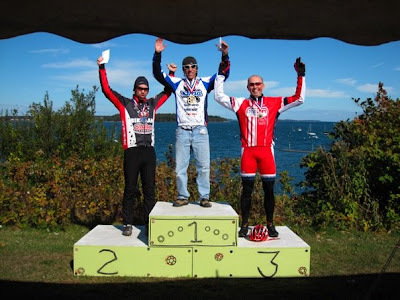 This was the first race put on by the good folks at Bikeman. The venue was beautiful - right on the Bay in Portland, ME. The course looked like a lot of fun, but with all of the running sections, I was glad that I made the call to be on the sidelines. As it was, I probably ended up walking the course twice between managing in the pits, and taking photos of Mike's races. Mike lined up for the Master's 35+ race, along with Todd and Alexis. The initial pace was pretty fast, and Wheels initiated a gap early, with Mike running in second place. He was soon joined by Al and Ryan from Bikeman though, and was gapped. A technical challenge forced Al to pit, Mike got by him, and Al, unfortunately, had a flat on his pit bike, ending his race. With a solid effort, Mike maintained a third place finish! All along, Mike had planned on doubling up - racing the Master's race and then the Elite 1/2/3 race later in the day. After the effort of the first race, he wasn't so sure about doing a second. He did end up registering and pinning on his number though, and lined up for another go at the course. This time, he managed a great start, and maintained a gap over fifth place (after an impressive pass on a run-up) to finish fourth (although with another lap, he MAY have managed to catch Colin M.). The weather was stellar throughout the day, and I had a blast watching all the races, and cheering on friends. Maybe I could get used to this ;). As nice as the weather was on Saturday, it was the diabolic OPPOSITE on Sunday. Cold, wet, windy... But, I still suited up and trudged out to Wrentham to cheer on Mike and the Master's racers (sorry to everyone else, but it was WAY too nasty to be out for more than one race!). 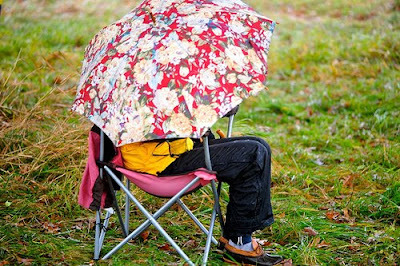 Given all the walking I had done the previous day, I took my chair, my rain gear and my umbrella, and planted myself under the only tree in the field. It was still cold and wet! With the weather, and the muddy conditions, Mike opted to race his new SSCX bike - a Felt. And then he convinced Thom P to race his SS (although it was his MTB) instead of his brandy-new geared 'cross bike ;). Mike had a great start, and came by me leading the pack. He later said, though, that he was over-geared on his bike - and I could see it on the long straights in the mud - he struggled to turn the pedals over. He ended up doing well, and finishing 4th overall again. We didn't wait around for results - too wet and cold. And I'm glad we didn't wait any longer than necessary - we ended up driving home in a snowstorm! ACK! Congrats to MKR! Yet another podium to impress us with. Wait till tomorrow's Oreo pic - even better ;). We had her in Maine with us, and left her in the van while we were out and about. She wiggled her way in between all of the bags and my seat... About gave me a heart attack when I went to look for her! Gran Prix of Gloucester - LATE!